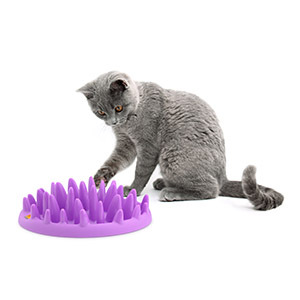 Northmate Catch Cat Slow Feeder Bowl is an interactive feeder for cats. Uniquely designed to stimulate their natural instincts and also their ability to catch food with their paws. – Prolongs eating time significantly. This results in a happier and healthier cat. – Available in one size, designed for all breeds. The beautiful purple color reflects the majestic nature of the cat. – Made of hard plastic (without phthalates) and be used outside and cleaned in the dishwasher. – Firstly, a one-piece molded feeder for cats and small pets. – Secondly. is made in hard phthalate-free plastic with four anti-slippery feet. – Thirdly, is a one-sized and one-colored product. – Fourthly. consists of 37 purple spikes – all of them between 2 and 6 cm in height and all of them smoothly rounded. – Finally, has an outer edge allowing wet food and approx. 0.3 liter of water. One of the most fascinating things about cats is their complex nature, being both domesticated pets and wild nature from nose to tail. During daytime they’re loving members of our families with scratches behind the ear and sleepy moments at the lap. During the night, however, their instincts tell them to go hunting for mice and birds around the neighborhood. It’s obvious that one of the greatest challenges for any cat owner is to make a home which manages to reflect both sides of this double nature. Not all cats have free access to outside environments, and even fewer are able to hunt around the neighborhood at night. Thus, many cats live a great deal of their life indoor without being able to follow their most basic instincts.